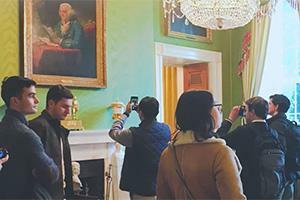 This semester, American University launched a unique undergraduate course, "A History of the White House," in partnership with the White House Historical Association. Throughout fall 2018, students involved in the class have visited DC sites related to White House history, including the White House itself, and heard from speakers like Betty Monkman, former White House curator, and Adrian Miller, author of The President's Kitchen Cabinet. Students and faculty members share their experiences in this first iteration of the innovative course.